What would Massachusetts be like without Christmas? The early settlers found out shortly after Christmas was banned in Boston during the 17th century Puritan era. Later it took nearly two centuries before Christmas was deemed truly fashionable in the city and indeed throughout Massachusetts! The town Norman Rockwell made famous. 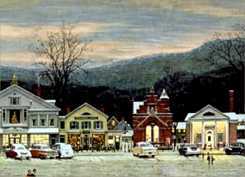 • Stockbridge is the town painter Norman Rockwell made famous with his depiction of Main Street at Christmas. Today, Stockbridge continues to celebrate the holidays the old-fashioned way with a recreation of the famous scene depicted by Rockwell. • Instead of a sleigh and reindeer, Santa comes to town by boat to Nantucket Island every year courtesy of the U.S. Coast Guard. Santa's arrival kicks off the Nantucket Christmas Stroll of holiday events including the Festival of Trees at the Nantucket Whaling Museum. • The largest holiday display in all of New England? You'll find it at Bright Nights at Forest Park in Springfield, Massachusetts featuring 3 miles of holiday lights complete with horse-drawn carriages pulling passengers through themed areas such as “Toyland”, “Jurassic Park”, and “North Pole Village”. Christmas at Faneuil Hall - Check out the fun and frivolity happening this year at Boston's major tourist magnet featuring street performers, tuba & choral music, a bell ringing ensemble, and the official Boston Christmas tree lighting. Boston Ballet - The Nutcracker - One of Boston's oldest traditions with an overview of the performance, ticket information and online ordering. Boston Holiday Pops - Would it be Christmas without it? Check out his year's dates & times along with TV and radio broadcast schedule. Boston Christmas Craft Festival - The annual shopping extravaganza and gingerbread house competition happening at Boston's World Trade Center. Edaville Christmas Festival of Lights - A major draw for thousands near and far to the old-fashioned holiday train excursion. Old Sturbridge Village - Christmas by Candlelight - Historic reeactors explain the old Christmas traditions in a charming celebration of the season that includes sleigh rides, music and caroling, and a talk with Father Christmas. Christmas Tree Farms in Massachusetts - Listings throughout the state with location and contact details and related Christmas entertainment and activities.